When my daughter first started school I was super excited. She would meet new friends, get out of the house and learn new things and one of my favorite things was preparing and making her lunch for school. I have to admit that now, four years into school, making lunches have been a drag. I not only have one lunch to make, but two. I know, some have more than two lunches to make and I shouldn't be complaining, but it's hard when you have picky eaters. Not so much my son then it is my daughter. Sometimes she comes home with her lunch either untouched or only one thing eaten from it. I've been trying to switch it up and have had help via Pinterest and other foodie blogs with wonderful lunch ideas and since going back to school from Christmas break most if not all of her lunch is gone. I have no complaints about my son, he eats everything (seriously, everything!). One thing I never have to worry about not being eaten or traded with friends with my kids are their Snack Pack puddings and jello. I love that this is a wonderful treat my kids can eat while being at school and that it's peanut free so it won't cause some other kid with an allergy to have an attack. These little desserts are perfect and just the right size too. Not too much, so the kids never waste them. There are so many things you can do with Snack Pack puddings, you can eat them just as they are, dip them in fruit, freeze them and make pudding pops and so much more. So I was more than thrilled to be a part of the Snack Pack No Tradesies Blog Tour. Along with sharing with you all the awesome tips Snack Pack has to offer I was sent a few things of Snack Pack pudding along with a lunch bag, a few sandwich shape cutters, a mini speaker (which my husband loves and says it goes pretty loud for being so small) and a few food containers that are leak proof, which I love. Sandwich Shape-up: Even a favourite sandwich can seem boring and routine when it shows up in the lunchbox day after day. Keep things interesting and kids engaged by breaking out the cookie cutters and cutting the sandwiches into fun shapes. Kebab it up: skewering some bite-sized veggies on a kebab with a side of veggie dip is a different and fun way to make sure veggies are not coming home at the end of the day. Utensils are key: let your kids pick out their utensils, napkins and lunchboxes. They definitely won’t be reaching for the aluminum, and giving them a say means they will take pride in their lunch pack. Have bright, colourful spoons on hand so kids can choose whether it’s a yellow, blue or orange kind of day! 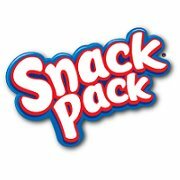 Be sure to check out Snack Pack on Facebook to get some new tips and the latest news on your favorite pudding! Disclosure – I am participating in the Snack Pack “No Tradesies” blog tour by enCompass Media on behalf of Con Agra Foods. I received compensation as a thank you for participating and for sharing my honest opinion.